The Nazis left Vienna with three enormous concrete flak towers that were used as platforms for anti-aircraft guns during World War II. At the end of the war they were left as silent reminders of the Third Reich and all its inhuman madness. They are still standing today and are an ongoing source of discussion among politicians and urban planners. One of the towers has been used as an aquarium since 1957 and in 1991 the US artist Lawrence Weiner painted a text on the upper section as part of the Vienna Festival in that year. 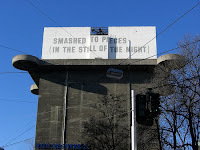 The text reads "Smashed to pieces (in the still of the night)". Now the aquarium's owners want to expand it and to paint the outside of the tower with appropriate undersea motives. But these plans have been called into question by Vienna's culture minister, who does not want any development to affect the integrity of the artwork. It is another interesting example of the seemingly eternal conflict between preservation of the past (even when, as in this case, it is a past many would rather forget), development and commercialisation of valuable urban space and the integrity of public art. The balancing act required is as delicate as ever and creative but sensitive solutions are the only way out. Ah... the age-old debate.. It's all about standards and where to draw the line.. reminds me of a quote "Art, like morality, means drawing that line somewhere". I suppose everytime a decision is made with regards to things like this, a new line is drawn.. somewhere. Do more channels make for better TV? Albert Camus to be Pantheonised?